Here is an easy glasses case pattern! Since glasses come in all sorts of sizes, this pattern can be adjusted to be longer or wider as you see fit. Be sure to choose a yarn that will not scratch or leave yarn residue on your lenses. 100% cotton yarn is used in the photo. The yarn in the photo is also variegated, containing multiple colors. To adjust the size of the glasses case, follow the instructions within the pattern. Gauge: not important for this pattern. Follow the directions in the pattern to adjust the size as you see fit. Note: if you change the number of chains, the total number of stitches in each of the following rounds will be twice the number of chains you start with here. Repeat round 2, 14 times or until the glasses case is as long as you desire. Then finish off. Need help? Leave a comment to let me know and I’ll be sure to help! This entry was posted on Wednesday, March 17th, 2010 at 5:00 AM by Rachel Choi	and is filed under Free Crochet Patterns. You can follow any responses to this entry through the RSS 2.0 feed. You can leave a response, or trackback from your own site. Great pattern Rachel! I like how you included the instructions for crocheting on the other side of the chain. It’s really helpful. Thanks for the pattern I may make one for my glasses! Rachel, thank you for your site. I used your easy patterns to jar my memory in order to crochet again. What a help! When making the eyeglass case, is it important to use a really soft yarn so the glass/plastic does not get scratched? Did you line your case? Hi Gigi, lining the case is a good idea! I didn’t do it to mine since my yarn seemed to not scratch. But if you do line, you probably won’t have to worries about the yarn scratching or leaving fibers on your lenses. The Round 1 directions don’t make sense to me. They ask you to hdc into hdc’s, when all we do before Round 1 is create a chain. They’re aren’t any hdc’s to stitch into for Round 1, just chains. Is there a Round missing before what is called Round 1? Wouldn’t you have to hdc into that chain before you hdc into hdc’s? Hi Peggy, that was a typo, thanks for catching that! All fixed now! Let me know if you still need help. I think you still need a lining because the ear piece of the glasses stick through the yarn. I also added a flap [decrease sts on only one side of the case by doing 5 rows, decrease a sts on each end til 1 st remains, finish off & weave end through] onto the case and add a button or Velcro for closure. Rachel, I can get the first round, but I’m lost on how to keep the rounds straight after that. I keep ending up in a spiral which I know wont finish the same. I’m teaching myself how to crochet and this was a great beginner/easy pattern. Thanks! I am trying to make this case for myself but I am having a little difficulty. I can do the first round until I get to the slip stitch part. Do I slip stitch in the hole under the ch-2 or into one of the chains? I was slip stitching into the hole under the Ch-2 and my pattern was starting to spiral. Is it suppose to spiral? Thanks! Hi Lanisa, the slip stitch is made in the top chain of the chain 2 (which is also the second chain you made). If you turn after each row you make, it should prevent the stitches from spiraling. The slip stitch will join the end of the round to the beginning. You will turn your work the same way as you do when you work in rows. I think I got it now….thanks.. I think I understand. You do 16 HDC SL ST, then 16 HDC then CH 2 — and you just keep going around and around alternating a SL ST then a CH 2…..
Is that correct. After 3 practice cases I think I finally figured it out…at least it’s the first one that looks smooth and correct. What I was doing was stopping, turning the work and then reversing back instead of keep going. Let me know if I got it …. what does it mean when you write spiraling ??? Where do you see spiral? Let me know so that I can see the context and help better. Hi Nas, the “sl st in top of beginning ch-2” at the end of each round means to make a slip stitch into the top of the chain 2 that you made at the beginning of the round. The top of the chain 2 is the second chain that you made. So you’ll make a slip stitch into that chain. It’ll join the end of the round to the beginning. Hi there! Sorry but I’m confused… Am I supposed to actually crochet a chain long enough that when folded will be the width of the case? And then the slip stitch makes it into a tube? I think I’m missing something unless my understanding is correct as above. Please clarify. Thanks!!! Hi Summer! There’s no folding required in this pattern. The beginning chain will be the width of the glasses case. On round 1 you’ll be working across the chain, then along the “opposite side of the chain”. Please see the link in round 1 for the tutorial on crocheting on the opposite side of the foundation chain. That tutorial will give you a better idea of how the case is constructed. thanks so much! I’m a brand new crocheter – as in all I’ve made so far are dishcloths haha.. this is the first non dishcloth thing I’ve made and I was able to follow the directions and it worked up nicely! thanks!! I am not getting this, HELP! How do you go back on the opposite side without adding more stitches to make it curve? Also why do you chain 8 and then chain 2 more INSTEAD of just chaining 2? Check out the tutorial in the post for how to crochet on the opposite side. You’re are adding more stitches when you crochet on the opposite side. You can just chain 10, since 8+2 = 10. But there is an option to adjust the size of the glasses case. So if you are adjusting the size you don’t want to count the chain 2 as a part of the width, else the width isn’t going to turn out to be as wide as you want it to be. The chain 2 is added later as part of the height in the first row. I did see the tutorial but I guess I still don’t get it. If you do 8 hdc and then 8 hdc on the opposite side I don’t see where the added stitches are coming from and the directions just say 16 hdc as the total. Yes, you will have a total of 16 hdc when you are done. You will work 8 hdc across the row like you normally would. Then when you work on the opposite side you’ll make the other 8 hdc. So you have a total of 8 + 8 = 16 hdc. I meant chain 10 not 2? Hi Cassandra! No worries, we all get stuck on things sometimes, even if it’s suppose to be easy! On round 1, do you have a total of 16 hdc? Also, try taking a look at the tutorial that is linked on round 1 about working on the opposite side, as that is probably to trickiest part of the whole pattern. Yes to both of those, I had my mom come over to help me (she is a master at knitting and crocheting) and it keeps starting to spiral when you get a few rows up. (And yes I read your previous replies on that, and we are making sure to sl st in the top of the ch 2 !! Idk what is happening ?? hmmm… make sure you are also turning your work after each round. If you don’t turn it will naturally make a spiral because of the pulling from the hook. Maybe also double check that the stitch count is the same on each round, if the stitch count is off it can distort the shape. I love this pattern. 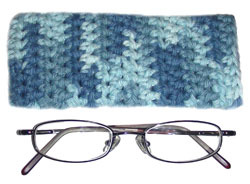 However, I find that with any crochet or knit pattern the arms of my glasses tend to poke through the stitches. I solved this by lining the case with soft felt or any other soft material. This not only prevents the yarn from scratching the lenses, but also keeps the arms from poking through.